In reviewing my grocery bills the last month, I made a non-startling discovery: we paid almost $30 in cheese alone the past month. Now, I suppose this should come as no surprise, considering that I also made the recent discovery that I eat cheese at every meal, including breakfast, almost every day of the week. I think my cheese intake might finally have overtaken my chocolate intake. Man, I should have been born Swiss. The following dish is like a Subway meatball sandwich (just like my Change It Up Challenge a few months ago dealt with), but in casserole form. Plus, this casserole is about 10X richer (& therefore fattier, probably) in taste than Subway’s meatball sub, which is always a plus. Unless, of course, you’re on a diet. Or at least a diet that doesn’t consist of eating cheese and chocolate at every meal. My only notes on this were that, like Subway’s sub, I felt it could have used more meatballs (can you ever have enough meatballs? I submit that you cannot), and that I probably could cut a little bit down on the spread next time so I don’t feel like I’m just caking Crisco right onto my thighs. But anyway, sticking to the subject: this recipe is for one thickly delicious casserole. And it even lasted us (yes, Matt included) through more than two meals. Now that’s what I call impressive. In a bowl, combine onions, crumbs, and Parmesan cheese. Crumble beef over mixture and mix well. Shape into 1-in. 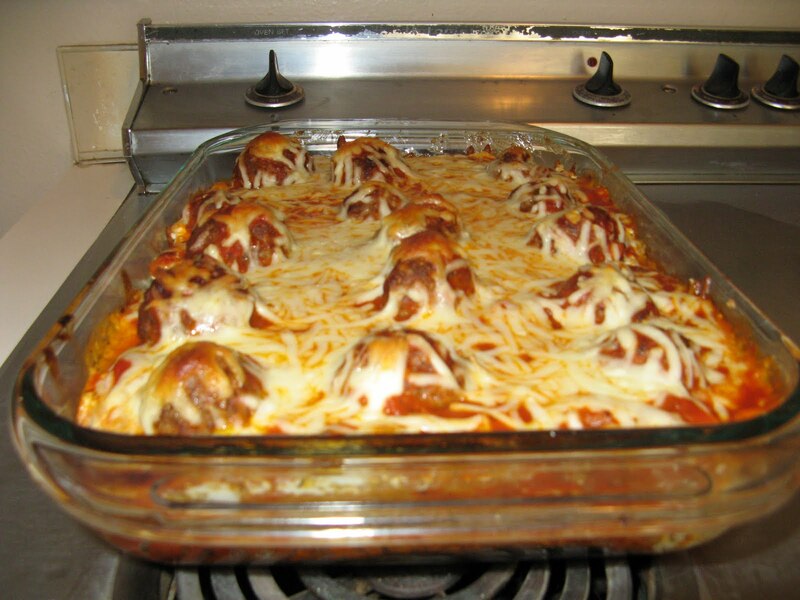 balls, place on a rack in a shallow baking pan. Bake at 400 degrees for 15-20 minutes or until no longer pink. Meanwhile, arrange bread in a single layer in an ungreased 13 x 9 x 2-in. baking dish (all of the bread might not be used). Combine cream cheese, mayonnaise, Italian seasoning, and pepper; spread over the bread. Sprinkle with 1/2 cup mozzarella. Editor’s note (from cookbook): Reduced-fat or fat-free mayonnaise is not recommended for this recipe.